Few radio shows feature both Al Bowlly and ZZ Top on their playlist, but Desmond Carrington's The Music Goes Round was such a show, a Radio 2 Friday night fixture for twelve years. Prior to that Desmond had hosted the Sunday lunchtime All Time Greats from 1981 to 2004 with a music selection, chosen by listeners, that could be equally diverse, even though it did tend to veer towards easy listening and the nostalgic. That 36 year run of weekly music shows finally came to a dignified and poignant end in October 2016 when ill-health forced Desmond to finally hung up his headphones. Desmond Herbert Carrington was born and raised in Bromley where he attended the County Grammar School. Perhaps sensing that his future was in the arts his first job was as an office boy at Macmillan's the publishers for 18/- a week. But his calling was acting and his first professional role was as a Cockney schoolboy in Goodbye Mr Chips at the Theatre Royal, Nottingham. He then secured regular repertory work with the Penge Court Players. In the early years of the Second World War Desmond joined the army, serving in the Royal West Kent Regiment, initially posted to Northern Ireland before serving out in India and Burma. Here he got his first opportunity to broadcast by opening up Rangoon Radio after the Japanese army had left. By 1946 he was serving as a commissioned officer out of Colombo in Ceylon and managed to wangle a job at the new forces station Radio SEAC (South Eastern Asia Command). Based in a palm grove some 15 miles outside Colombo the coverage was immense, taking in India, East Africa, Australia, New Zealand, Indo-Chine, Japan, the Pacific and the west coast of the States. On the team with Carrington were David Jacobs - they would remain firm friends thereafter - McDonald Hobley, Charles Chilton and Alexander Moyes. On demob Desmond knocked on the door of the BBC but they sent him away telling him that he was not of "sufficient promise" for them to offer him a job. However he would eventually secure a post as part of the BBC Drama Repertory company where he worked across a range of schools broadcasts and drama productions such as Children's Hour, Paul Temple and Mrs Dales Diary. In parallel to his acting career Desmond pursued his other great passion of cinema by carving out something of a specialism as an adapter of film screenplays for radio broadcast. He'd presented some film programmes on Radio SEAC and back in Britain he'd come up with the idea of recording the soundtrack from the film projector using a sound mirror and a tape recorder. With the agreement of the film companies he then used the edited highlights from the recording to form a radio programme. He took the idea to both Radio Luxembourg where the scenes would be linked together by Wilfrid Thomas in a series titled Movie Magazine. Later Desmond himself would present a number of shows for the station that included film soundtracks as well as interviews and film scores in programmes such as Hollywood Calling and the sponsored Alka-Seltzer Movie Parade. He continued to appear on Luxembourg into the mid-50s. Desmond's big break finally came in 1958 when he got a telephone call from a colleague who was now producing Emergency Ward Ten asking if he'd like to play the part of the son of a patient. Desmond leapt at the chance to do some live television over three months. His performance was deemed a success and he was invited back to play the part of a doctor - the part of Dr Chris Anderson. He remained in the show until 1964 appearing in over 200 episodes. Of his time on Emergency Ward 10 Desmond would later recall the problems of having to memorise "some appallingly difficult and long medical terms, Then I had the bright idea of writing them on the inside of the sink as we were always scrubbing up for the operations on the shows. During rehearsal, it worked fine, as there was no running water in the sinks. When it came to the live transmission I watched in horror as my medical terms were washed away as I started to scrub up. There was nothing for it but to improvise". Ironically it was Desmond's TV fame that led to his future career as a disc jockey. 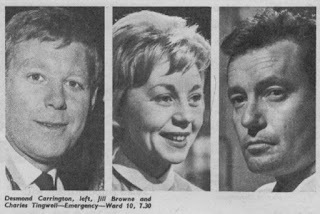 In 1962 he was invited to compere Housewives' Choice for a fortnight whilst he was still appearing as Dr Anderson and, as the Radio Times billing adds, also appearing on stage in Doctor in the House at Streatham Hill Theatre. He got repeat bookings on Housewives' Choice for the remainder of its run between 1963 and 1967. In 1963 he was playing music from stage and screen on the Light Programme's Twelve O'Clock Spin. For the second half of 1964 it was more songs from the musicals in Record Showtime with the Radio Times billing helpfully informing us that he was appearing in Wanted on Voyage at the Grand Theatre, Leeds - by now he'd just left Emergency Ward 10. The following year it was a back to the world of film in Music from the Movies, a series scripted by Movie-Go-Round's Peter Haigh and produced by announcer Robin Boyle (a second series, produced by Tony Luke followed in 1966). And, in case you were wondering, Des was now in Face to Face at the Marlowe Theatre in Canterbury. Throughout 1966 Desmond could be heard every weekend hosting Open House with "records of assorted speeds, sizes, and styles to suit people with assorted tastes". In 1967 he was back with more Music from the Movies, this time working with the future radio comedy producer Richard Willcox. There seemed to be no room for Desmond on Radio 2 when it replaced the Light in September 1967 but in 1968 he was back adapting film soundtracks with Spencer Hale for Radio 4's Disney Time that included Mary Poppins, Dumbo and Bambi. Finally, from December 1968, and running until September 1972, Desmond had a daily show on Radio 2 playing the latest releases in Album Time. Aside from three appearances in charge of After Seven in 1973 there was radio silence for the next eight years. Desmond was invited back into the Radio 2 fold in early 1981 to introduce a series of shows featuring The Magic of Stanley Black (other programmes would also feature Mantovani, Ronnie Aldrich and Robert Farnon, John Gregory, Geoff Love and John Fox). He owed his return to producer Paul Walters who, Paul reminded him on their first meeting, had swung the boom on some of those old Emergency Ward 10 broadcasts at the ATV's Highbury studios. The success of the Magic of... shows led to an invitation to present the Sunday morning All Time Greats. 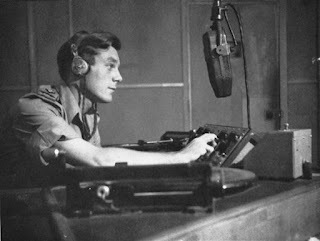 Desmond expected it to run for a month or so but after the first recording producer Jack Dabbs told him, "well that's your pension, Desmond". He was right, it ran for 23 years! In October 2011 Desmond gave listeners to The Music Goes Round and Round an opportunity to hear again the first edition of All Time Greats. Although the BBC hadn't kept a copy, Desmond had. "It's the listeners' programme, not mine. They choose the records". He gets about 500 suggestions a week requesting favourites pieces and reckons some 6,000 records have been chosen by Radio 2 listeners over the past four years. "Some people misquote the title as Old-Time Greats but it's certainly not that. We can play records right up to the present day, though I admit that most requests are for music from the 50s backwards. Most requested record? Without a doubt Glen Miller's Moonlight Serenade. Bunny Berigan's I can't get started is a close second. In August 2004 network controller Lesley Douglas decided to have a re-shuffle and the Sunday lunchtime All Time Greats came to an end. In this broadcast from 8 August 2004 Des tells his listeners that the decision was not his, "and I should like to make that clear". The follow-up series, The Music Goes Round, now on a Tuesday evening, was the same eclectic mix condensed into an hour with each show adopting a theme for all or part of that hour. Come April 2010 Desmond moved to Friday nights where he remained until last year. 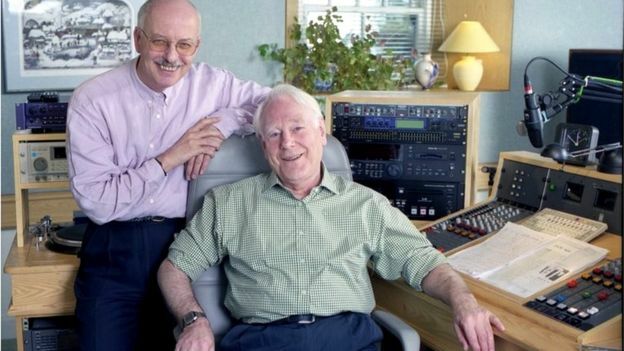 For many years he'd been broadcasting from his home studio but by now the show's opening was always the memorable "Evening all from home in Perthshire, Scotland". 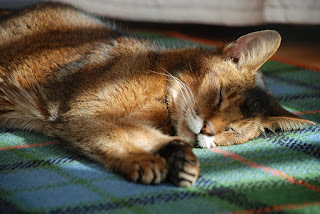 Home being near Dunning where he lived with producer and long-time partner Dave Aylott and, often curled up at Des's feet during the show, cat Golden Paws Sam. In 2013 Desmond spoke to Tim Blackmore about his radio career in a Radio Talk podcast for the Radio Academy. In May 2016 Desmond celebrated his 90th birthday with this special edition of The Music Goes Round. What listeners didn't know. and for a while neither did Radio 2 management, was that Desmond's health was failing as he was battling with cancer and Alzheimer's disease. In December 2015 he'd suffered a second heart failure but was back at the microphone a few days later. 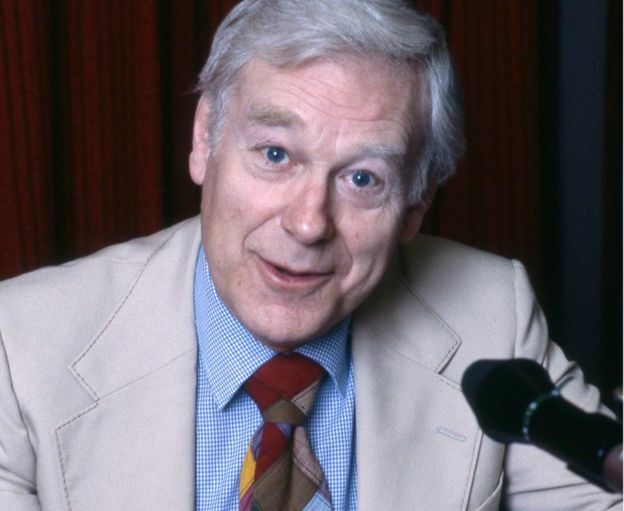 However in October 2016 he announced that after 70 years on the air he was reluctantly having to "hang up my headphones" and say "enough is enough". Here is that final show from 28 October. Yesterday, on the day Radio 2 had already scheduled a tribute to Desmond, it was announced that he'd died. The voice of a true radio all time great silenced. Thanks for the audio files. 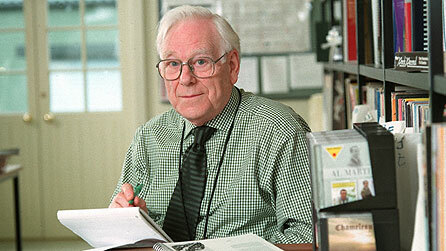 Great to hear Desmond Carrington again.